First things first, you may be asking yourself, What are ice dams? If you’re unaware of these damaging rooftop phenomena, don’t fret, a lot of people haven’t taken notice of ice dams on their roofs, because they can be difficult to see. 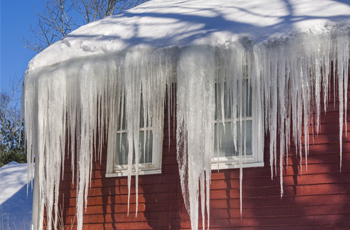 Ice dams can form around the edges of your roof and on concave corners of your roof. They can also form if there is an obstruction on your roof, or they can form near components that jut out of your roof (e.g. a chimney or vent). Ice damming happens as snow melts and refreezes over several days. When this happens, the ice can build up and create a barrier that keeps water from flowing off of your roof as it should. Then, that water will freeze again, thus exacerbating the problem. Over time, you’ll be left with a growing issue, and the integrity of your roof, flashing, and gutters may be damaged. How Do Ice Dams Damage Roofs? Ice dams can lead to all sorts of problems, including leaks and damaged roof components. Again, ice dams are caused by the melting and freezing of water which means that the dam will expand and contract. Anything that is frozen to these ice dams will be forced to move with this expansion and contraction, and that can cause damage. Your gutters may be pushed away from your home. Shingles can be torn apart. And flashing can be bent out of shape, or it can detach from your roof. Beyond that, ice dams can effectively dam water against your roof. On warmer days, a pool of water will form on the dam, and that water will be held against your roofing material. That’s bad news, since pooling water can seep through tiny cracks in your roofing material, and it may penetrate the subsurface of your roof, which means that you’ll have a leak. That’s why it’s crucial to take care of ice dams right away, if you’ve noticed that they’re forming on your roof. On top of the issues that ice dams may pose, excess snow can be problematic for homeowners, especially here in Massachusetts. When snow falls by the foot, you’ll have to be cautious to ensure that your rooftop isn’t overburdened with weight. Never let your roof accumulate over 2 feet of snow, since it can become overburdened with weight. Most modern roofs are designed to hold 20 pounds of weight per square foot, and 2 feet of snow can weigh that much — especially if the snow is wet and dense. However, as a general rule, you should have snow removed from your roof if there are 6 inches of snowfall or more, since this snowfall is more likely to remain on your roof for days on end — causing ice dams. Once again, you should also be concerned about ice dams that can form on your roof as temperatures vary from day to day. If you have snowfall on your roof that is resting their for a week or more, it’s likely that it can form an ice dam. Be wary of snowfall when the days are warm enough to melt snow, yet the nights are cold enough to freeze any water that has melted. If you’re sitting under a roof full of snow, then it’s time to reach out for help. While you may be able to remove snow from your roof on your own, we advise you that you hire a professional crew. Why? Well, that answer is two-fold. First and foremost, snow removal is dangerous, especially when you’re dealing with tons of snow precariously resting on a sloped roof. 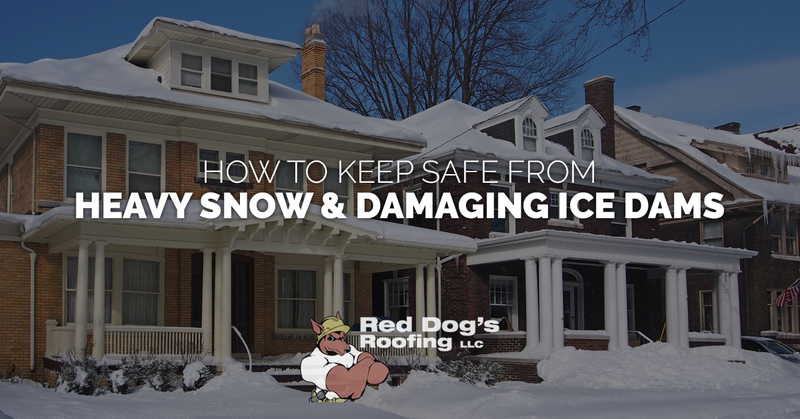 With Red Dog’s roof snow removal services, you can trust that we’ll remove that troublesome snow safely, so that you don’t have to risk life and limb to keep your home safe. Secondly, we won’t damage your roof while removing snow. We have the proper tools, techniques, and know-how to ensure that your roof doesn’t incur damage during a removal, no matter what material it is made of. If your roof is buried in troublesome snow or damaging ice dams, then reach out to us for our roof snow removal services. Stay safe and warm this winter!